"Leave. Go away. Go to Fulton County. I don't care about your people." MARIETTA, Ga -- A sign of the times. 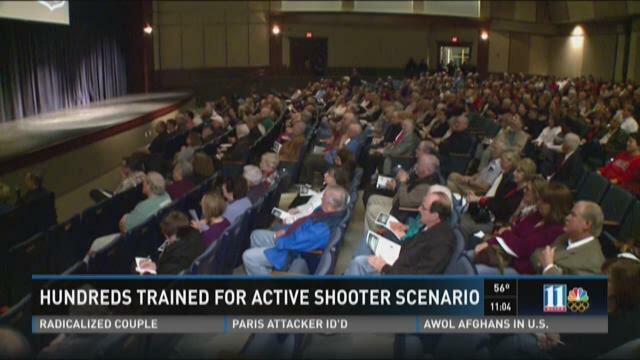 Nearly 1,000 people turned out for an Active Shooter Seminar conducted by the Marietta Police Department at Marietta High School Wednesday night. Officers gave instructions on how to prepare, in advance, for an active shooter situation, and also offered tips on what to do when you're trapped inside the building during one. There is a science to violence. And in the last few years, it has evolved to include a brand new chapter: The rise of the active shooter. Ross Harris faces multiple charges, including malice murder, felony murder and cruelty to children, in the June 2014 death of his son, 22-month-old Cooper. Harris’ attorneys described search warrants obtained by the Cobb County Police Department as “a fishing expedition.” Those warrants produced many of the high-profile pieces of evidence in this case. COBB COUNTY, Ga. -- Cobb County Police have issued a statement about an officer's controversial remarks made to a driver after a traffic stop. Brian Baker said the officer made the remarks after he was pulled over for allegedly speeding and an improper lane change. Dashcam video showed Baker asking the officer several times, "Can I go?" The officer then told Baker, "Leave. Go away. Go to Fulton County. I don't care about your people." COBB COUNTY, Ga. (WXIA) – The security guard injured in a shooting at a Kennesaw FedEx facility is celebrating a breath of fresh air. Since the shooting, Sparkman has undergone more than four dozen surgeries. On Oct. 26, his wife, Jamie Lynn Sparkman, wrote that the 49th surgery would hopefully be his last. LOS ANGELES -- Marietta's Zach Seabaugh is the final metro Atlanta singer on The Voice.